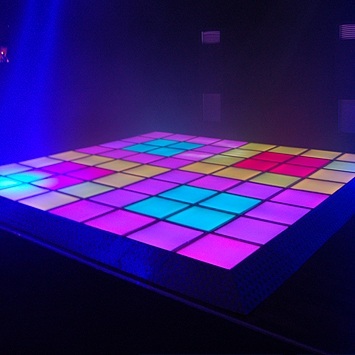 The LED dancefloor lights up in hundreds of pre-programmed permutations from a kaleidoscope of colours to a personal message scrolling across the floor. 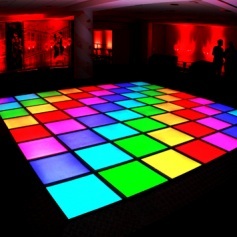 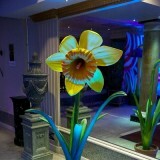 We can even colour coordinate the dancefloor to fit in with your colour scheme to create a true wow factor! Each panel is 10cm high and 60cm x 60cm and can be fitted in any configuration up to maximum size of 6m x 6m. 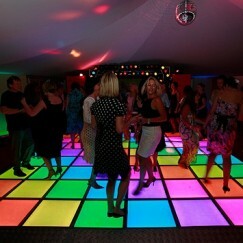 The dancefloor is also fitted with a metal trim edge to avoid any trip hazards. The dancefloor is water resistant and load bearing and due to its low power consumption can run off a 13amp socket, ideal for indoor venues and marquees. 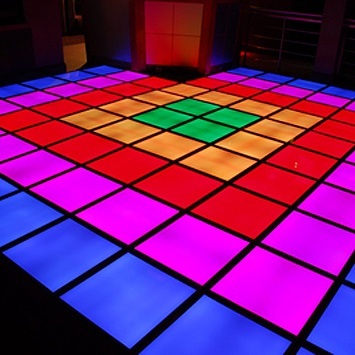 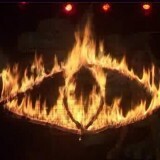 Please note, this dance floor is not suitable for outdoor use.